Guys, Are You Tired of Regular Fit? Try These Guess Jeans Instead! Let’s be honest, there are not many choices when it comes to menswear. Often times, the women’s section at any retail store will overweigh the men’s. Men are simple creatures, just like how they choose their jeans. Instead of the regular fit, they should explore more fashion options with various types of Guess jeans. Versatile in many ways, jeans look good with literally anything. That is the reason why it is a staple in many people’s wardrobes. These days, there is an increase of menswear which are taking cues from womenswear such as with Guess jeans. The brand offers much more options when it comes to menswear. Why be basic when you can stand out with other styles of Guess jeans? Channel your inner biker with this cutting-edge, modern jeans. The biker style jeans is very much inspired by the original biker pants which is often made out of leather. Leather is not a very stretchy material which explains the ribbed sections close to the knees. They are elastic underneath so that it can be stretched when a biker rides for long hours. These biker-style jeans is made of stretch cotton and it is low rise with a narrow leg and bottom. 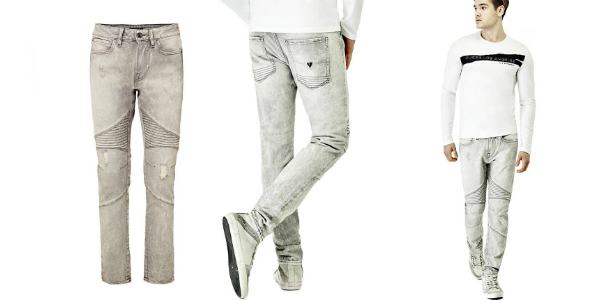 Slip into this sleek tapered jeans with abrasion details for every fashion-forward guy. Similar to the skinny jeans, tapered jeans become skinnier as they reach the ankle, but is much roomier at the top. If you’re the type of person who likes carrying around a lot of items, the 5-pocket model will work great for you! Look model-like and show off your sleek silhouette with the Superskinny jeans. These pants can be worn with everything as it is trendy yet has a classic feel. Made with stretch cotton denim, it ensures maximum comfort whenever you put them on. You can always make these Superskinny jeans an alternative to your Skinny jeans. New to the term cigarette jeans? Taking the form of a cigarette, the jeans are basically slim fit and not tapered. Just like this 5 pocket cigarette jeans, which is made to be looser around the ankle area. It also comes with 5 pockets so that you can easily stash away loose coins, your wallet or anything else. One of the best options for taller men, the High Rise Slim Jeans are ideal for those who like to wear their jeans around the waist. As the jeans give off a more formal look, it is suitable to be worn in a business casual setting.